For anyone with an interest in church buildings Reigate has plenty to offer. St Mary’s is another large parish church. It possibly dates from the C12th but the exterior appears Perpendicular, it also had some restoration in the C19th. An interesting point is that the Nave has no clerestory. There is a tower with embattled parapet and a stair turret which rises above the battlements. Above the vestry is the Cranston Library, possibly the oldest public library in England, which the Rev Cranston founded in 1701. Reigate Heath Windmill church, also called the Mill Church, is possibly the only windmill that is a consecrated church in England. The church has a brick roundhouse below a restored boat shaped upper part with windmill sails. The windmill is grade II and dates from around 1765. For more information enquire at St Mary’s. Also in St Mary’s parish, the ‘Tin Tabernacle’ is still in use as Reigate Heath Church. Tin tabernacles had wood frames clad with cast iron (no tin involved). The prefabricated buildings were a popular solution for church buildings in the C19th and early C20th. The wood lining made them pleasant and comfortable inside. UK manufacturers found them a useful export. Manufacturers once sold the buildings as kits, and some congregations saved money by doing the building work themselves. Reigate Priory Museum is in a historic, grade I listed building. Originally an Augustinian monastery; the building has had many uses through time. It now houses the Museum and a school. Although only a short walk from the centre of town, the building is in 65 acres of park, some of which is wooded, and adjacent to the North Downs. The Museum is temporarily under repair so visitors should check before going. In the town centre, is the iconic, red brick, Town Hall. Dating from about 1728, it stands on an arcade with open archways to the sides. It has three straight sides, and one curved. At the top is a clock with four faces, there’s a cupola and a weather vane above. Holding pride of place are the Carron Iron work’s K6-type, George VI, cast iron, telephone kiosks. Founded in the industrial revolution, the Carron motto was Esto Perpetua, meaning ever lasting. 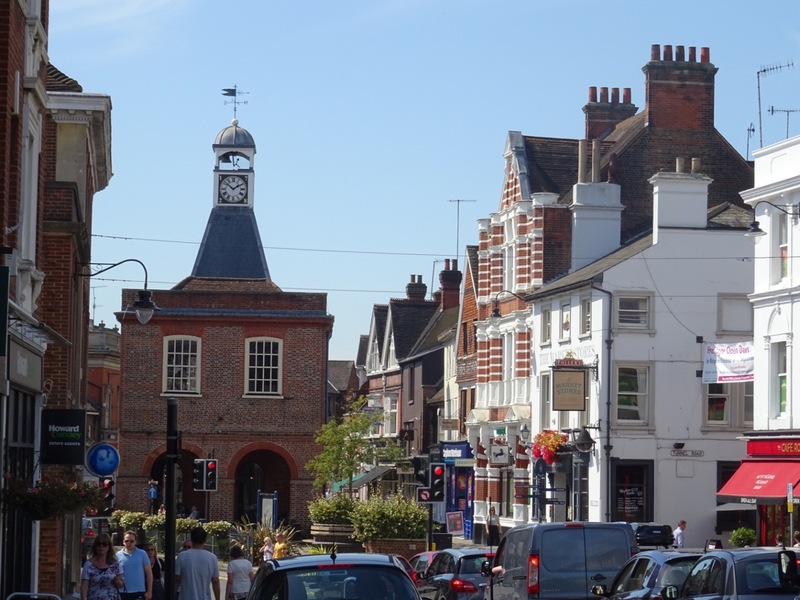 Reigate and Banstead Borough Council produces a Town and Down Circular Walk, a guide for walking in the town and through chalk grasslands, a rich wildlife habitat. Previous PostWith Spring on the doorstep there’s no better time to take up the dog lead and walk off the winter blues. Next PostWooler in Northumberland lies mid-way between Hadrian’s and the Antonine Walls, and is the gateway to the Cheviot Hills.